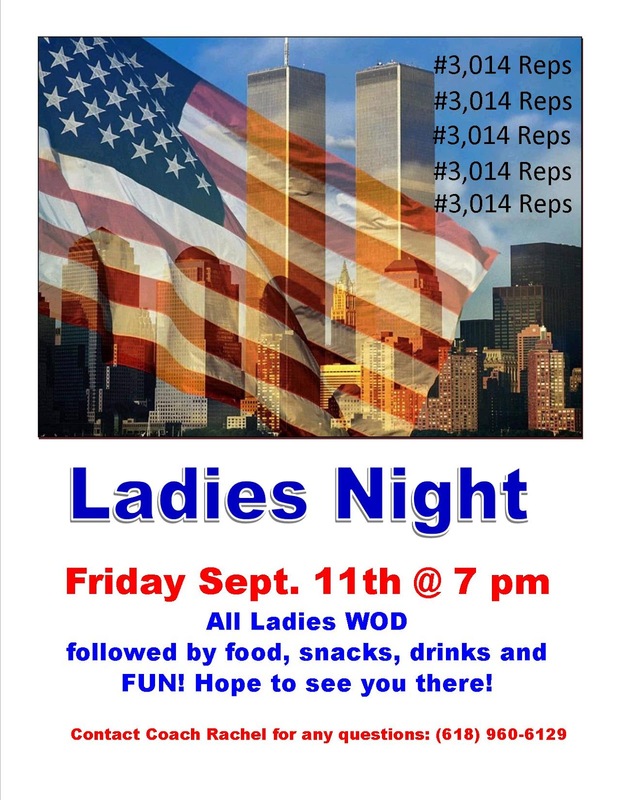 Join us for a Ladies Night at Muddy Water CrossFit. We understand not all of our members get to WOD with other athletes/women so we would like all of you to have the opportunity to do so! The event will take place on Friday September, 11th so our theme will be RED/WHITE/BLUE. The WOD will start at 7pm so show up early to warm up if you can. Along with the theme we are doing a special WOD that some other CrossFit gyms do in remembrance of those who lost their lives on 9/11 so check out the Facebook page or ask a fellow member what the 3,014 reps are for. It will be followed by a little TGIF, fyi! If you can’t find the page let Rachel know and she will add you. Also, there is a food sign up sheet on the board if you would like to bring something but do not feel obligated. This will be your chance to throw down with other women in our gym and die together. Should be a lot of fun so don’t miss out!